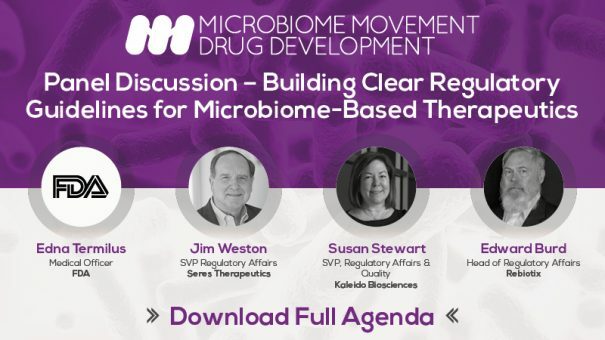 Earlier this month, the newly established Microbiome Therapeutics Innovation Group (MTIG), a coalition of organisations leading the research & development of FDA-approved microbiome-based therapeutics, provided an important statement on the current regulatory frameworks for FMT treatments*. Following this assessment, coupled with the 2017 publication of the U.S. Regulatory Considerations for Development of LBPs as drugs*, we understand that staying up to date with the current regulatory guidance for microbiome-based therapeutics will be critical to the clinical development and market approval of these breakthrough treatments. Access the latest event guide for further insight into these sessions in addition to the 70+ expert speakers from the pharma, biotech and academic community presenting throughout our comprehensive 3-day agenda. If you’re looking to absorb the latest discovery, clinical and commercial advances in microbiome-based therapeutic & biomarker development coupled with a unique networking opportunity alongside a growing community of cutting-edge researchers from industry and academia, join the Microbiome Movement and help unlock the therapeutic potential of the microbiome to push your own projects to the next level. I look forward to meeting many of you in Boston this summer.